I've recently started adding 3D texture to my art journal pages. I really like using embossing paste with stencils. This page was a test page I did using a Julie Fei Fan Balzer stencil. I started with a piece of deli paper on the background. I love to used recycled materials and this deli paper was actually on my friend's sandwich. My friends are use to me collecting odd things from them for my art journal. Next I stenciled using a mixture of embossing paste and spackling compound. I let it sit over night so it would be completely dry. I tried using a stencil brush to color the letters but got more color on the background than I liked so I used paint pen to make the letters pop. I added washi tape at the top and bottom and didn't really want add anything else to it because I really liked those funky letters. 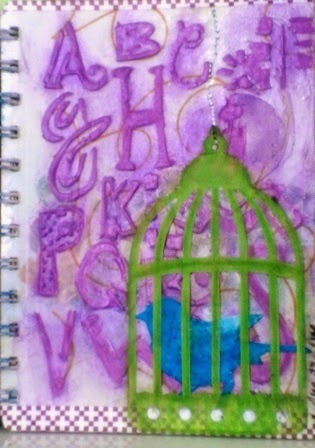 I finally decided to add Tim Holtz's Bird in a Cage in bright colors and be done with it. I'm adding a link to my friends over at Art Journal Journey... the challenge this month is living beings and I think my little bird qualifies. When I put dowd stencil paste and want to paint it. I put the stencil back over the dry paste then paint. You don't get very much on the background unless paint is watery. Like what you are making. Love your color combination. One of the best things about following you is I never know what I will see! What experiment do you have in your artistic stash! Thank you very much! Great effect on the background..wow!